Birthplace : Lake Charles, Louisiana,U.S. Ida Lewis "Queen Ida" Guillory is an Louisiana Creole accordionist. 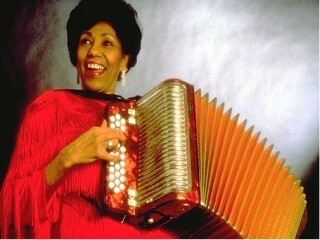 She was the first female accordion player to lead a zydeco band. Queen Ida's music is an eclectic mix of R&B, Caribbean, and Cajun, though the presence of her accordion always keeps it traditional. Queen Ida related in her book of recipes and stories, Cookin' With Queen Ida: "Bon Temps" Creole Recipes (& Stories) From the Queen of Zydeco Music, the way in which she acquired her stage name. At the end of a masquerade dance on Mardi Gras night in California's Bay Area in 1975, Ida Lewis Guillory was brought onstage with the introduction "Tonight we're going to crown you Ida--Queen of the Zydeco Accordion and Queen of Zydeco Music." A reporter in the crowd, Peter Levine, did a story on the dance that appeared a few weeks later in the Sunday magazine of the San Francisco Chronicle, and soon calls were coming in from Bay Area clubs to book "Queen Ida" for appearances. At that point, however, she didn't even have a band. She'd just been sitting in that night with her brother, Al Lewis--better known as Al Rapone--and his Latin/soft rock group, the Barbary Coast Band. Since the early 1970s she'd been playing the accordion and singing with the Barbary Coast Band, or with another group called the Playboys, at private dances held by the African-American community that had relocated from Louisiana to California. In Cookin' With Queen Ida, she wrote that "one of the reasons they wanted me to sit in was that a woman accordion player was such a novelty. Every time I played one or two songs with the Playboys at those dances, the area in front of the stage would fill up with men." But Queen Ida was always taking on jobs sometimes thought to be more suitable for men. As a young girl she had learned to drive a tractor and hired out to help neighboring rice farmers, experience that proved helpful later when she began driving a school bus. Initially Queen Ida hesitated to accept the invitations that followed her press exposure, but her brother told her he had already agreed to many of them, and they appeared as "The Barbary Coast Band, featuring Queen Ida." To reflect her importance as she expanded her repertoire and did more songs with the band, they became "Queen Ida and the Barbary Coast Band." Still later the group's name changed to "Queen Ida and the Bon Temps Zydeco Band." Though she moved with her family from Lake Charles, Louisiana, to Beaumont, Texas, when she was ten, and then on to San Francisco when she was eighteen, Queen Ida never really left Louisiana behind. Her first language was French, and her father, a rice farmer until he moved to California, even brought his own rice with them when they moved so the family would be sure to have plenty to eat. There were a growing number of friends and relations in the Bay Area who were from Louisiana, and Queen Ida's young adult years were filled with the music and food of her former home. Queen Ida came from a musical family--her father played the harmonica, and her uncles played the accordion and fiddle. Her mother also played the accordion, and it was her instrument that Queen Ida first learned to play, after taking piano lessons for a time. For years, however, music was only a part of her social life. After she married, she attended nursing school, but quit to have her first child. When her three children grew older, she took a part-time job driving a school bus. It was only gradually, with the encouragement of her family and friends, that she began to perform occasionally in public. The word zydeco--a corruption of the French term "les haricots," meaning beans--attests to the music's humble beginnings with the French-speaking people of color in southwest Louisiana and southeast Texas. Having little money to buy instruments or pay for entertainment, washboards and spoons became the means for making music in these areas. Eventually the accordion became the instrument most closely associated with zydeco. Queen Ida differs from the great zydeco player Clifton Chenier and Cajun accordion players in that she plays neither the piano accordion nor the button accordion with only 11 keys. Queen Ida's accordion has 31, allowing her to play more melodically because she can play notes from more than one key. She also tends to use the treble side of the accordion, as many Mexican accordionists do, to better blend with the other instruments in the band. The Bon Temps Zydeco Band also incorporated a fiddle player, which is unusual for a zydeco band though common in Cajun music. Traditional tunes were part of the group's repertoire in addition to Queen Ida's own songs, including "Rosa Majeure," or Rosa of Legal Age. Queen Ida's music is an eclectic mix of rhythm and blues, Caribbean, and Cajun, though the presence of her accordion always keeps it traditional. She explained in Keyboard: "It was Zydeco music I started with. It was Zydeco music my parents--my mother especially--asked my brothers to keep alive. And now we have a following for Zydeco music. There are songs that I play that are not totally Zydeco. But Zydeco has always been a musical gumbo because it's got all the elements. It's not rock, it's not country, it's not blues, but it has all those elements. Also, the nature of the accordion carries a lot of its weight into making whatever we play sound like Zydeco." Queen Ida has become an ambassador for the accordion, which is now often used in pop music by such artists and groups as Paul Simon, John Mellencamp, and They Might Be Giants. By 1976 Queen Ida had appeared at the Monterey Jazz and Blues Festival and landed her first record contract, with GNP/Crescendo Records, a Los Angeles record company that specializes in jazz and with whom she has recorded all her albums. Still, as she noted in Cookin' With Queen Ida, "I didn't feel that music would be a full-time career for me." She kept her job as a school bus driver until her youngest daughter, Ledra, went to college and she started to tour more widely. In 1978 Queen Ida met her agent, John Ullman, and things began to change. The following year she was nominated for a Bammy, or Bay Area Music Award. She lost out to Taj Mahal, though it was he who suggested she tour Europe and had his agent arrange for Queen Ida's first two-week European tour. Her brother Willie joined the band as washboard player for the tour, and, though her brother Al eventually left the band to resume his own career, it has remained a family business. Her husband Ray left his job as a truck dispatcher in 1986 to become the group's manager, while her son Myrick replaced Willie on washboard, in addition to providing help on the accordion and vocals. The group was soon touring Europe several times a year, performing for appreciative audiences. Queen Ida's career was progressing in the United States, as well. In 1980 she was nominated for a Grammy Award for her album Queen Ida and the Bon Temps Zydeco Band in New Orleans. A Grammy Award for the best ethnic/folk album came her way in 1982 for Queen Ida on Tour, recorded in Denmark. She felt the band always sounded best live and most of her albums have been recorded while she was on tour. Since then Queen Ida has appeared in Francis Ford Coppola's movie Rumblefish and a documentary about Louisiana music by Les Blank called J'ai Ete au Bal. She has also performed on the television shows Saturday Night Live and Austin City Limits. In 1988 Queen Ida became the first zydeco musician to tour Japan, and a year later she went on a tour of Africa sponsored by the State Department. She added Australia and New Zealand to the list in 1990. Though she began her career later in life, Queen Ida has yet to slow down and serves as an inspiration to many of her fans. In her 1992 GNP/Crescendo Records biography she maintained: "When I was a little girl, women in Louisiana were expected to raise their children, tend chickens, go to church, and bake bread. I tell older women that they are just now mature, and that they just now know what direction they want to go in, something they didn't know at an earlier age. Sometimes I feel like a teacher or a missionary, but I believe it's never too late to expand your human potential." View the full website biography of Queen Ida.